Optics and algorithms is building a tellyscope! After much deliberation it will be a 10" (250mm) aperture dobsonian with a focal ratio of 5.2, aka a focal length of 1300mm, almost exactly the same focal length as my 102mm Maksutov, but obviously much more resolution and light gathering. Why a focal ratio of 5.2? Most 10" dobsonians have a focal ratio of around 4.7, but I am adding 100mm to that focal length to make the mirror slightly easier to grind and figure, and also to keep the size of the secondary down, because the scope is going to be a planetary specialist. The question is... what secondary to buy? They come in a range of sizes. For example GSO make 46mm, 50mm, 63mm and 70mm diagonals. Commercial newts typically come with the 63mm size (25%), but I'm thinking of trying for a 50mm or 46mm secondary. This will improve contrast in the image. Also a smaller secondary will be lighter so constructing a good spider vane and secondary holder will be easier, and the scope should hold collimation better. I would appreciate any comments or corrections to the code. Here is the output of the program, more accurately the CSV from the program fed though OpenOffice.org's spreadsheet. The X axis gives the field stop radius, and the Y axis gives the illumination level at the edge of the field stop (1.0 being full illumination). 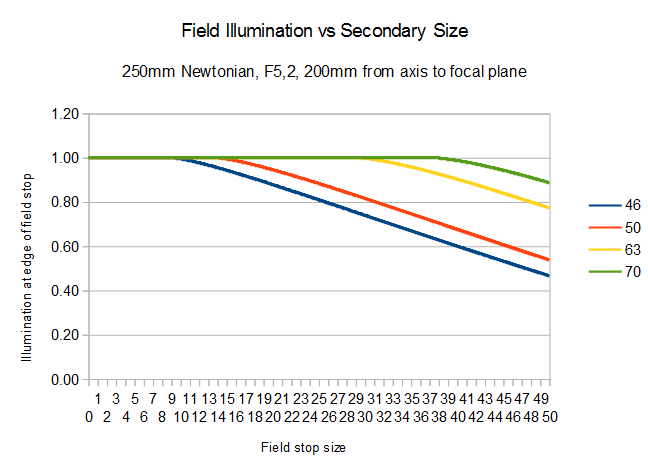 For comparison, the maximum field stop of a 1.25" eyepiece is ~28mm, and the maximum for a 2" eyepiece is ~46mm. The graph looks quite scary for the smaller diagonal sizes. To put it into context, I took the field stops of some Televue eyepieces and calculated the effective aperture at the edges of those field stops. I used Televue only because they publish the field stops for their eyepieces, as you can see here: Televue Eyepiece Specifications. 8mm Plossl 6.5mm 10" 10" 10"
11mm Plossl 9.1mm 10" 10" 10"
9mm Nagler T6 12.4mm 9.8" 10" 10"
16mm Nagler T5 22.1mm 9.2" 9.6" 10"
24mm Panoptic 27mm 8.8" 9.3" 10"
22mm Nagler T4 31.1mm 8.5" 9.0" 10"
21mm Ethos 36.2mm 8.1" 8.6" 9.7"
35mm Panoptic 38.7mm 7.8" 8.3" 9.6"
Although I may not indulge myself with Televue eyepieces, I might choose the cheaper options from competitors, which should work acceptably at F5.2. Converting the illumination to an effective aperture gives an interesting result: even a 46mm diagonal gives nearly 8" of aperture at the edge of the field of a 35mm Panoptic. With a workhorse like a 16mm Nagler, I would still get at least 9" of aperture across the field. The decision is made: a 46mm (18.4%) secondary is my choice!